Our 10-session modular units are ideal resources for IOPs and similar programs. They address key issues in substance abuse, behavioral health, dual diagnosis, anger management, conflict reduction, relapse prevention, aftercare and critical transitions. They are specifically designed for open-group/open admissions programs, like IOPs. Curriculum is MI- and CBT-based. Mental heath resource include DBT elements. This flexible, open group/open admissions program presents up to six 10-session modules. Each module presents a mini-journey through the stages of change, starting out with Pre-Contemplation resources and ending with Action Planning resources - a sequential approach to motivation which addresses key concepts in substance abuse treatment and relapse prevention. This comprehensive open group program package— available in both adult male, adult female, and juvenile versions— features a creative new approach: participants can be added to the group at any point, while the outcome-driven model provides structure and support for individual progress and change. This flexible modular program offers a solid, CBT-based approach to behavioral health, enhanced with selected Motivational Interviewing (MI) tools, DBT elements, and critical coping skills. The Bridge features a core of 40 sessions, divided into four 10-session units, and two additional 10-session mental health relapse prevention units for a total of 60 hours. Each themed unit provides a brief stages-of-change based approach, sequentially addressing precontemplation, contemplation, and key preparation/determination action steps. Shaped for this population, they provide structure for staff, address key treatment outcomes, and include summary elements within the curriculum to support clinical supervision and/or documentation. A critical advantage of this modular approach is that it provides a high quality outcome-focused resource without mandating a closed group programming model. Download a PDF flyer with more details! The core program is three (3) ten-hour units from the substance abuse resources and three (3) ten-hour units from the mental health resources. Extended program models available. Critical combined session achieves specific behaviorally-stated objectives integrated to support individual treatment plans. Resources provide the critical demonstration of achievement of objectives for clinical supervision, program documentation, and assessment of outcomes. Download a PDF flyer with complete details! Anger-- The primary focus of these resources is awareness and self-management of symptoms and triggers to anger. Key elements include a basic cognitive-behavioral (CBT) approach, supplemented by DBT mindfulness activities, distress tolerance skills, and tools designed to assist awareness and motivation for successful symptoms self-management. This unit provides many opportunities for problem solving and multiple Motivational Interviewing (MI) tools. Anxiety-- The primary focus of these resources is awareness and self-management of symptoms relating to anxiety. Additionally, the unit addresses feelings of guilt and shame. Key elements include a basic cognitive-behavioral (CBT) approach, supplemented by DBT mindfulness activities, distress tolerance skills, and tools designed to assist awareness and motivation for successful symptoms self-management, especially anxiety. This unit provides many opportunities for problem solving and multiple Motivational Interviewing (MI) tools. Depression-- The primary focus of these resources is awareness and self-management of symptoms relating to sadness and depression. Additionally, the unit addresses grief, loss, loneliness, and boredom. Key elements include a basic cognitive-behavioral (CBT) approach, supplemented by DBT mindfulness activities, distress tolerance skills, and tools designed to assist awareness and motivation for successful symptoms self-management. This unit provides many opportunities for problem solving and multiple Motivational Interviewing (MI) tools. Trauma-- The primary focus of these resources is awareness, insight, and more effective self-management of the impact of distressful life experiences, such as past traumatic events. 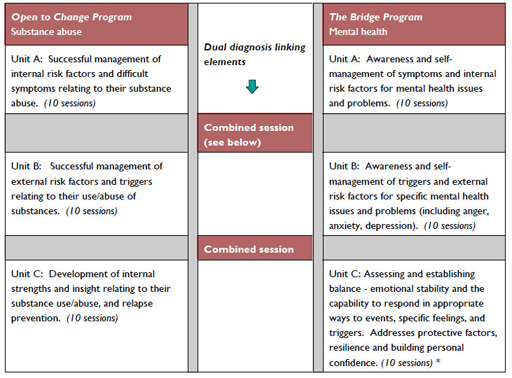 Key elements include a basic cognitive-behavioral (CBT) approach, supplemented by distress tolerance, affect regulation, and coping skills, and tools designed to assist awareness and motivation for successful symptoms self-management. This unit includes multiple Motivational Interviewing (MI) tools. If you have any questions about product, pricing, or how we can customize our materials for you, feel free to contact us by e-mail. If you are considering placing an order, please fill out our phone consultation form.